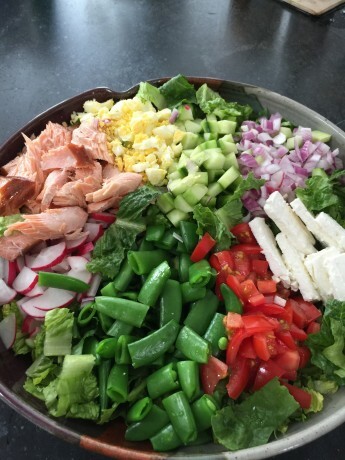 Green and fresh, the crisp romaine, salmon, snap peas, radish, avocado and red onion make this more than a simple salad. Yet with using packaged or store-prepared smoked salmon (not the sliced salmon, but a chunkier, meatier version - see cook’s note), the only cooking is the 10-minute hard-boiled egg and a quick blanch of snap peas. Serve as a spring or summer dinner salad for 4, or stow away a portion in the fridge, undressed, for the next day’s lunch. Do not be tempted to use bottled dressing here and miss the brightness of this mustard-lemon-honey dressing – so easy to make. Prepare the toppings by cutting the vegetables and hard-boiling the eggs. Blanch the snap peas by dropping them in boiling water for 1 minute. Drain, then splash them with cold water to stop the cooking. Cut each snap pea in half. Place the chopped romaine lettuce in a large, wide bowl, or platter, with enough room to show off the toppings. In similar groupings, place the tomatoes, cucumbers, avocado, radishes, snap peas, red onion and sliced feta cheese on top. Break the smoked salmon fillet into medium to large chunks, and add. Crumble the hard-boiled egg, and place on top. Make the dressing by whisking together the lemon juice, Dijon, honey, garlic, herbs, olive oil, salt and pepper in a mason jar. Pass the dressing at the table, and let each guest spoon or pour on their own. Shake well. If you make ahead, save the avocado and tomatoes and slice at serving time.